It is Orange County Fair season, and that means demolition derbies, carnival rides, concerts, pig races, petting zoos, dance exhibitions and clowns. With so much to do, where does one start? As visitors enter the gates to the OC Fair, they are greeted with digital signage technologies that promote the events of the day. More than 1.3 million OC Fair guests, who are looking for a good starting point, receive an entertaining view of everything the fair has to offer, including suggestions on when and where to start their day. Not only are the digital displays positioned at the gates, they are also in front of each main venue on the grounds. In order for a guest to have a positive experience, he or she needs access to current information on venues and event schedules. The OC Fair has a mission to provide timely updates across the 150 acres of fairgrounds space to make sure the guests are informed of any last-minute changes. To achieve this mission, the Fairgrounds IT team decided they needed to use the latest in technology to engage the fairground guests. The IT team decided a video wall solution would provide superior reliability and advanced rendering capabilities. This combination would allow the creative team to design the most advanced digital content and allow them to control presentations, video and fairgrounds information like never before. A video wall solution can also allow the IT team to remotely schedule and upload layers of content for seamless playback. They can integrate high-definition video feeds into any presentation from a central PC to manage the distributed visualization of information around the fairgrounds. Originally, the OC Fair wanted a video wall for the new administration building to showcase the grounds and show past events, more than 150 upcoming events and the current events underway. As they searched online for a solution, they found a Hiperwall video demonstration on YouTube. It was exactly what they wanted for the building’s lobby. Traditional video wall systems require specialized equipment and complex software, which were too expensive for their needs. The Hiperwall distributed visualization solution was far more affordable and will work with any type of display, whether LCD, plasma, projection cube, CRT or rear-projection, of any size and resolution. In addition, Hiperwall uses ordinary computers connected together using an ordinary Ethernet network, eliminating the need for complex, expensive hardware devices. “We visited Hiperwall for a demonstration and saw the whole package,” said Rob Castagnoli, technology supervisor for the OC Fair and Event Center. Coming away from the demonstration extremely impressed, they met with Brian Presley, business development manager with Cibola Systems, to purchase and install the Hiperwall video wall system. Cibola is an audiovisual company that designs and integrates AV technologies that inspire communications. The first step was getting the video wall installed in the lobby of the new administration building. Once the OC Fair team saw the robustness of the software, the creative team went into hyper-drive and began looking at other areas of the property, where the software can push information to patrons and vendors. Hiperwall 3.0’s animation capabilities provide the OC Fairgrounds’ creative team with a unique ability to deliver content to single monitors, video walls and distributed displays. And the ability to animate content brings content to life. With the new animation editor, users can control when each element enters; where it is displayed; how it is sized, colored and rotated; and how special effects like transparency, mosaic, and black/white filters are applied. Once the animation sequences are created, it is easy to add, remove or make changes to content elements and modify the timing of the animation sequences, introduce new elements or make a variety of other changes. Hiperwall 3.0 renders each content element as an individual object in real time, eliminating the traditional rendering process and reducing development time and expense. Prior to installing the Hiperwall system, all the venues were updated by “sneaker net,” where they took USB thumb drives to each location manually. It was time consuming and cumbersome at best. The Hiperwall distributed visualization system is ideal for the OC Fair to distribute content directly from a central location to numerous display devices no matter where they are located. The installation provides the OC Fair a high-performance visualization system that is highly scalable without requiring any specialized hardware infrastructure. Shortly after Orange County was established in 1889, the Orange County Community Fair Corp. was formed. This group put on a small fair in 1890 that included a horse race and a few exhibits in Santa Ana. In 1894, another group, the Orange County Fair Association Inc., took over. The first Orange County Fairs were primarily livestock exhibitions and horse races. At the turn of the century, a "carnival of products" was added and the fair became an annual event. In ensuing years, the Fair was held in Santa Ana, but after World War I it was moved to Huntington Beach for two years and then back to temporary grounds on East Fruit Street in Santa Ana. In 1916, the fair was taken over by the newly organized Orange County Farm Bureau. The first OC Fair Board was elected in 1925 and the fair relocated to Anaheim, across the street from the Orange County Hospital. In 1925, a rodeo and carnival were added. Like all Hiperwall installations, the Orange County Fairgrounds system uses an ordinary gigabit Ethernet switch as the complete operating infrastructure. All 15 display nodes, the control node and all four sender nodes are directly connected to this switch via ordinary Ethernet cabling. All command/control, content delivery and synchronization communications take place over the IP network that runs through this switch. The OC Fairground’s initial deployment consisted of eight display nodes, one control node and four sender nodes, all installed in the organization’s watch center. After two months of use, WSIN recognized the value of the technology and decided to increase the size and reach of their installation. They added four additional monitors to the watch center, increasing its display real estate by 50 percent to 12 total monitors. 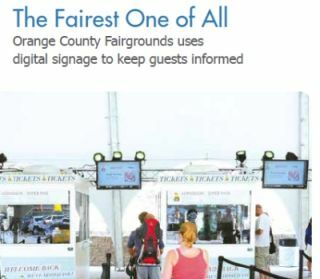 In addition, the OC Fairgrounds installed three satellite displays in the fairgrounds’ different venues, enabling the creative team to update content easily even when there was a minor time change.